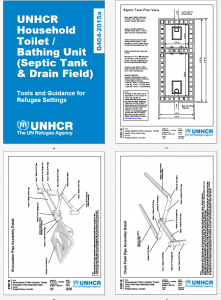 This document contains materials to help UNHCR and WASH actors build post emergency household pour flush toilet and bathing units with septic tanks and drain fields in refugee settings. Tags: Bathing Facilities and Household Toilets. Tags: Desludging and Excreta Transportation and Sewerage and Excreta Conveyance. 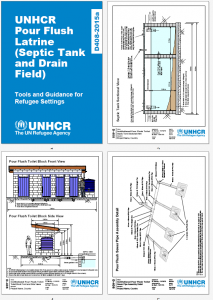 This sizing calculation tool has been designed to assist UNHCR and WASH actors correctly size drain fields for septic tanks in displaced settings taking into account numbers of users, soil type, and wastewater and sewage flows. 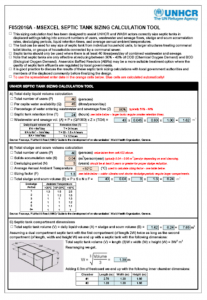 Tags: Drain Fields, Drain Fields, Drain Fields, and Drainage. Tags: Communal Toilets, Communal Toilets, Excreta Management, Excreta Management, Excreta Management, Excreta Management, Excreta Treatment, Excreta Treatment, Grey Water Disposal, and Grey Water Disposal. Languages: English, English, English, and English. Organisations: UNHCR, UNHCR, UNHCR, and UNHCR. 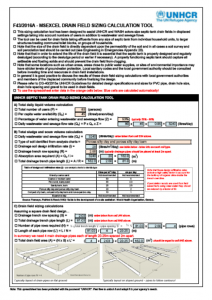 Categories: WASH Blank Forms, WASH Blank Forms, WASH Design Guidelines, WASH Design Guidelines, WASH Reference Documents, WASH Reference Documents, WASH Reference Documents, WASH Reference Documents, WASH Technical Designs, WASH Technical Designs, and WASH Technical Designs.